As promised, I'm going to wonder aloud with you this summer over some of the offerings at Simply Charlotte Mason. All my downloads are printed and tidy in a pretty new binder, so I'm ready to go! I'd like to start with the free e-book Education Is... before moving on to Laying Down the Rails: A Charlotte Mason Habit Handbook. character but will be lacking in mental development. 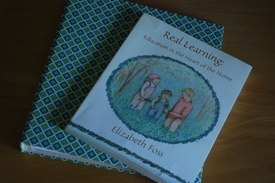 Charlotte Mason asserted that children are educated by their intimacies. That makes infinite good sense, doesn't it? Children learn from who and what they hold close. The goal of such an education is to surround the child with noble people and books and other things with which to form relationships. For a Catholic parent, the first intimacy we want for our children is a true personal friendship with the Lord. All our educating is directed to that end. We also recognize that the child living in a home that is also his "school" will form very close relationships with his parents and siblings. It is these relationships that we pray about unceasingly. We endeavor to be good examples and mentors. We want strong. loving bonds between siblings. Despite our inadequacies, we strive in our homes to emulate the Holy Family. 1. Children should grow up in a natural home setting, not an artificial, adapted "child environment." Before the Montessorians start throwing tomatoes, please consider that Miss Mason meant that "we should take into account the educational value of his natural home atmosphere, both as regards persons and things, and should let him live freely among his proper conditions. It stultifies a child to bring down his world to a 'child's level.'" She was not writing to parents in the slums of Italy where Maria Montessori founded her Casa de Bambini. she wasnot seeking to correct severe developmental and educational delays. She was addressing the parents in nineteenth century England who were likely to tuck their children away in a fully appointed nursery with a governess, far from the comings and goings of family life--far from the intimacies which should educate the child. 2. Character traits can be learned through the atmosphere of the home. 3. We must be careful how we live, because our children will pick up attitudes and ideas from us that will affect them the rest of their lives. 4.The atmosphere of our homes is formed out of the ideas that rule our lives as parents. As Catholic parents, we know that our sacred vocation is to raise children to know, love, and serve God. 5.Atmosphere is only part, not all, of a child's education. We must also give the discipline of good habits and the living ideas of a generous education. It is not enough for us to strew the house with good books and works of art. It is not enough to play music in the background as we read aloud at teatime. That we do those things is certainly important. And then, we must rise to the challenge of the discipline of good habits in ourselves and in our children so that all those good ideas can flourish. And we must prayerfully consider what constitutes the curriculum of a generous education so that we know what things to put within reach of our children. 6.The atmosphere of the home should encourage freedom under authority and obedience. These days, teatime is likely to be earlier in order to get out the door to soccer practice and they are a fair number of balls and ballet shoes scattered about, but all in all, this vision has served us well. So, tell me, what does an atmosphere, a discipline, and a life look like to you? Post your thoughts to your blog and leave a link in the comments (Mr. Linky was a disaster).